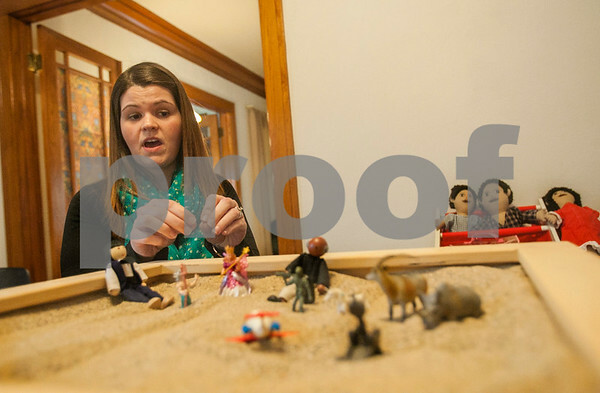 Nicole Soltas, a sexual assult therapist at Safe Passage, explains how free play with different characters on the sand tray in the children's therapy playroom at Safe Passage in DeKalb may help her key in on what is bothering a child on Thursday March 19, 2015. Soltas usually sees children after a disclosure of sexual abuse and through play, helps the child come to terms with what happened to them. She says parents should not ask leading questions with younger children but rather observe play and be vigilant if the child has an aversion to a place or activity once enjoyed.